Nowhere are the biases, limits and strangeness of photography – “the ultimate art form of modernity”10 – better exposed than in Pascal Grandmaison’s monumental Half of the Darkness (2010). 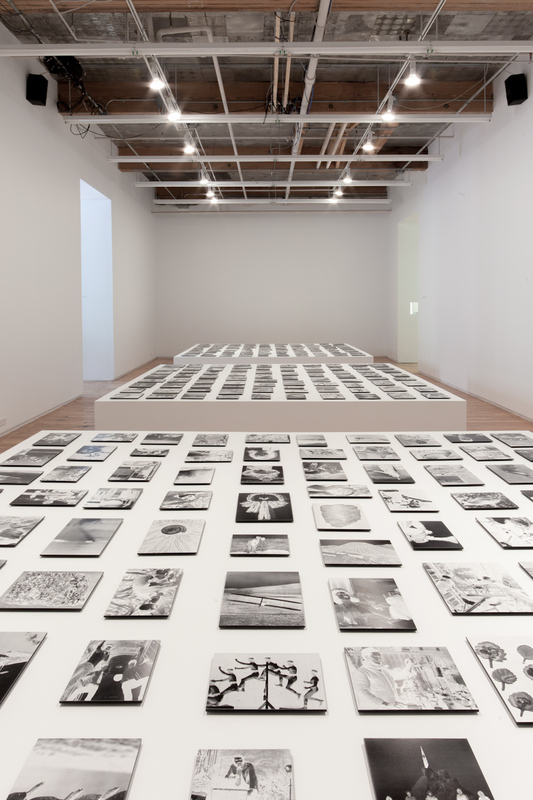 Over 250 photographs, printed in negative, are laid out across four large plinths: craters and canyons, technological breakthroughs and arctic expeditions, fungal spores, prisms and dinosaurs, enormous robotic hands, rockets and chimpanzees, to name just a few, are featured in this sampling of imagery. The photographs are either candid or posed, aerial or macro, but in every case “man” is depicted at his best, conquering the world with his footprints, flags and various optic instruments. Astronauts and spaceships, as well as an old steam engine, rest alongside a bearded woman and a man covered in butterflies. And a defunct Ferris wheel speaks of an age passed by. Taken in sum, this display of disparate photographs functions like an ashen memorial for the discredited dream of modernity. 10 Eric Rosenberg, “Photography is Over, If You Want It.” In Kelsey, Robin, and Stimson, Blake, eds. The Meaning of Photography. Clark Studies in the Visual Arts. New Haven: Yale University Press, 2008. 191. 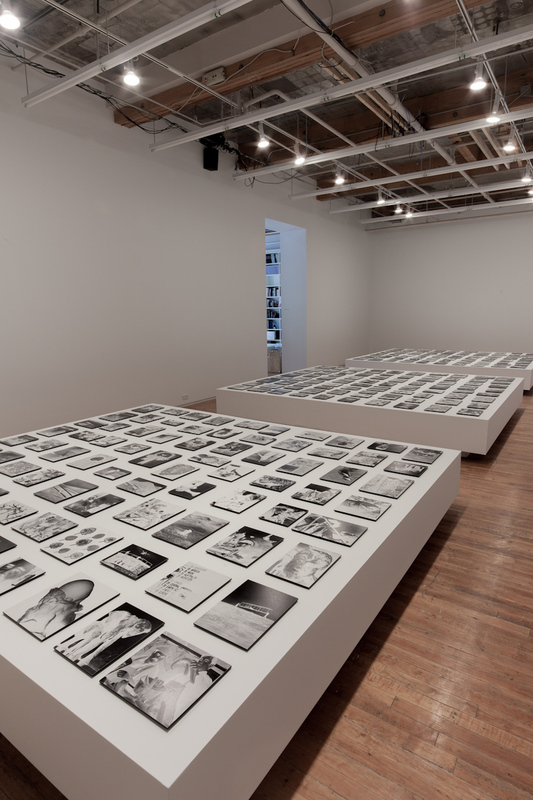 12 Marianne Hirsch, Family Frames: Photography, Narrative and Postmemory. Cambridge, MA: Harvard University Press, 1997. 6.
athletes at the height of their jump or the summit of a mountain. In each case what is depicted is a wished-for identification. On the other hand, photography also promises a “mechanical form of objectivity”13 and advances a positivist approach to the world.14 The numerous close-up photographs of various scientific specimens illustrate this well – their mysteries are exposed, turned into objects of knowledge. Due to this “double indexicality,”15 photography was heralded as a means of knowing the world and as a means of understanding the “self.” But more than drawing a parallel between them, the modernist investment in photography renewed the eighteenth-century promise to unite inner and outer realities in a process of self-realization.16 This alleged congruence is connoted by many of the images in Half of the Darkness. Consider for example the photographs of men (and they are men) wielding various optical devices to extend the parameters of their vision. In one image we see a man in the lab coat peering through a microscope: he is positioned as a unitary “I,” the sovereign subject of sight (as opposed to an object of the “gaze”), and under his lens he discovers a reflection of his powers of cognition. This congruence is thoroughly Kantian and the cornerstone of Western thought. 13 Robin Kelsey and Blake Stimson, “Photography’s Double Index.” In Kelsey, Robin, and Stimson, Blake, eds. The Meaning of Photography. Clark Studies in the Visual Arts. New Haven: Yale University Press, 2008. xii. 14 Urs Stahel, Well, What is Photography? Zurich: Scalo, 2003. 8. 15 Robin Kelsey and Blake Stimson, xi. 16 Robin Kelsey and Blake Stimson, xvi. 17 Julia Kristeva as cited in Appignanesi, Richard, and Garrett, Chris. Introducing Postmodernism. Thriplow, UK: Icon Books, 2004. 104. Half of the Darkness puts into question the authority of visual information by calling attention to the “visualization ‘error’”22 of the photographic (and modernist) viewpoint. 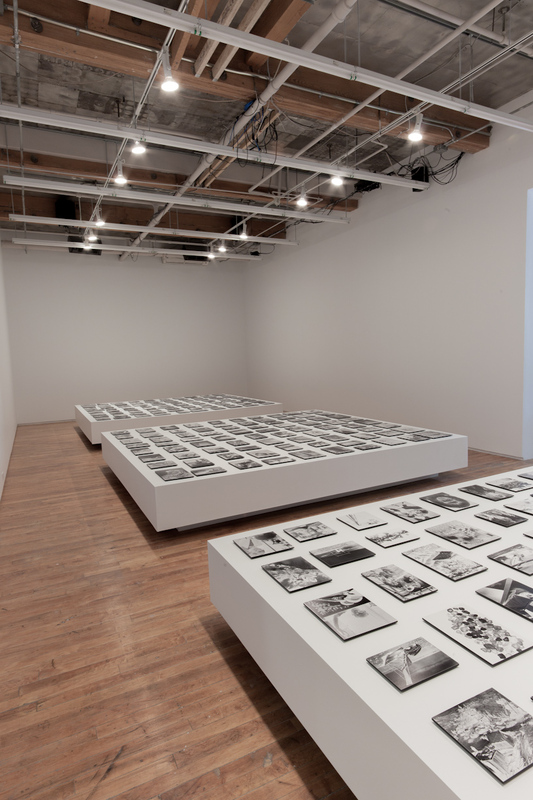 The exclusion of differences, of the other, is taken to its “logical conclusion” in the practice of genocide, a link which Grandmaison makes blatant: the museological stagecraft of Half of the Darkness is similar to what one finds in Holocaust museums – row after row of black and white photographs, documents of the lives destroyed by the Nazi regime. 23 Roland Barthes as cited in Geoffrey Batchen, “Palinode: An Introduction.” In Geoffrey Batchen, ed. Photography Degree Zero. Cambridge, MA: MIT Press, 2009. 5. 24 Barthes as cited in Batchen, 9.
are the camera’s blind-spots: blacks too deep to penetrate by the mind and eye alike. Visual constructions of historical “truth” come to look like so many fluctuating memories. “Memory is photography’s ultimate archive,” writes Rosenberg, “[b]ut it is a chimerical one, for memory in the end will always go its own way, refusing to contain an object outside of itself, a technology other to its own formation.”26 Rather than being lined-up in a transmittable historical narrative, Half of the Darkness is an abundant archive, a non-hierarchical database of ghostly impressions, non-linear and nearly nonsensical. It is as if Grandmaison opened the shadows to allow the viewers’ subjectivity to flow in, thereby reclaiming what was lost in the process of objectification and supplementing the photographs’ partiality – its mask of meaning – with the spectre of otherness. Let us return to the Ouverture series with which this essay opened. Pascal Grandmaison’s practice is accumulative, and so now, after considering many subsequent works as well as the stunning Half of the Darkness, its impact is easier to articulate: in the contours of these portrait heads, we fail to recognize their “identity.” Grandmaison points to our inability to know ourselves in the face of the photograph. These “portraits” are like facing the obstinacy of a mute, enigmatic child or the impossible question “what are you thinking?”27 The studium cannot encode the “other” at the heart of the “self” – the half that is lost in illustrating it. 26 Rosenberg, 191. 27 See Stahel, 7.